Experience Class IV rafting excitement close to home on the Deerfield River’s most exciting section, the Monroe Bridge Dryway. Combining the rush of advanced whitewater, the beauty of the northern Berkshires and the camaraderie of a paddling adventure, a Dryway rafting trip will be the highlight of your summer. From Factory Rapid past Dunbar Brook, Dragon’s Tooth and Labyrinth, the rolling whitewater keeps you on your toes while the rugged northern Berkshires provide a backdrop of exceptional natural beauty. We stop for a snack along the river, but after the trip, we return to our basecamp where a hearty, hot barbecue lunch and a slide show of the day’s adventures await. Our skilled guides really make the difference on this maze of rocks, holes and waves. Their expertise and friendly professional attitude help make your day memorable. Rafters ages 14 and up are welcome on all Dryway rafting trips. Participants must be comfortable in the water and able to paddle and work as a team. Participants on this trip may be required to swim aggressively wearing a personal flotation device in rocky, fast whitewater. 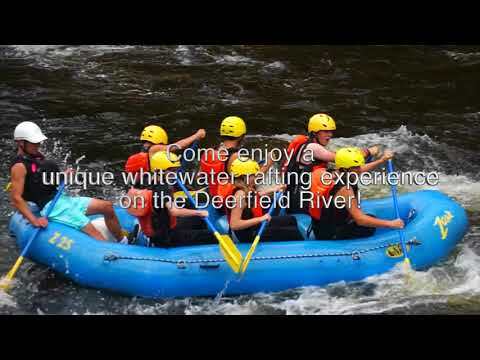 "We absolutely loved our day whitewater rafting on the Deerfield River! The guides, the food, the experience, the thrill of it all - simply amazing!!" - Lorraine T.
"I was a little nervous about getting on Class III and IV whitewater, but our guide, Finn, was so helpful and friendly. I had a blast and can't wait to go again!" - Darlene N.
"Kudos on the BBQ - the food was wonderful! I go rafting with different outfits and this, by far, has been my best experience. Most other outfitters just provide a dried up hot dog or burgers, but your selection of food was a pleasant surprise - I went for 2nds!" - Correne G.
Dryway water remains cool year round. Wetsuits, splash jackets, and neoprene river booties are available for rental. You are required to wear sneakers or other shoes that can be secured to your feet. No flip-flops or Crocs. Bring any required medications as well as extra money for souvenirs, coin-operated showers, etc. You should leave valuables and dry clothes and towels for after the trip in your locked vehicle. We will collect your car keys and return them to you after the trip. We generally put 5 to 7 people in a boat, but this doesn’t mean that you need to have a group of 5 to 7 to go rafting. For example, if you’re reserving two people, you may be paired with a party of 4 or 5. If you have a group of 10 people, we would just divide you into two boats of 5 that go out on the water together. We do not use nuts in our food, but cannot guarantee that the ingredients in our meals do not contain nuts or other food allergens. If you have food allergies or other special dietary needs, we strongly suggest you bring your own bag lunch in non-glass containers and we will pack it with the other lunches on your trip. You're also welcome to call our office at 1-800-532-7483 with any questions about the menu. If you intend to bring your own meal, please let us know ahead of time. Yes, we have westuits available to rent at Zoar Outdoor. Online or over the phone, you can pre-rent wetsuits for $15 plus tax; this package includes the wetsuit, a pair of river booties, and a splash jacket. Pre-rentals online or over the phone are non-refundable if you choose not to use them. You can also rent them here at Zoar before you trip for $15 for the wetsuit, and $7.50 each for the booties and the jacket or $25 for the whole package. Yes! Our photographer will be stationed at one of the rapids taking high quality pictures of each raft. Back at base you'll be able to view your photos, if you'd like you can purchase them on the spot. The Dryway trip meets at our base in Charlemont, Massachusetts at 10:30 am. Please try to be on time, since we must work within the schedule of water releases decided on by the power company. You will be required to read and sign a release of liability at this time. We raft a section of class III and IV whitewater on the Deerfield River in Northwestern Massachusetts. We put in below the #5 Station Dam and finish the trip at Dunbar Brook in Florida, MA. The trip usually takes about 6 hours overall, including registration, transportation to the river, a snack stop, a barbecue lunch served at our base, and a slide show of your run through the biggest rapids. Our snack stop consists of chips, salsa, fruit, brownies, and beverages. The Dryway dinner is a large barbecue spread of chips & salsa, marinated chicken and beef, veggie burgers, a hot veggie baked dish, marinated mushrooms, green salad, additional veggie salads, rolls & butter, and a dessert as well as drinks. Registration for this rafting trip takes place at 7 Main St. in Charlemont, MA. You can park in the unpaved lot and head up the stairs to the kiosk outside the red building. There, guides will direct you to the appropriate pavilion.